On 9 March 2018 the prime ministers of the three Baltic states announced that they would not back any attempt to censure Poland over democratic backsliding. Coming on top of Hungarian assurances that Budapest would veto any attempt to sanction Warsaw under Article 7 of the Treaty on European Union, and the Bulgarian government’s concern that a move against Poland would cause ‘sleepless nights’ in Sofia, this meant that the Polish government could rest easy. Under Article 7, the Council would need 22 votes simply to determine that there is a ‘clear risk of a serious breach’ of the rule of law. Given Bucharest and Zagreb’s hostility to EU action on backsliding, this take the count well past the break-even point. In Warsaw, Budapest and Sofia (which currently holds the rotating Presidency of the Council) this might look like a crisis averted. But for the EU it could be the beginning of a bigger crisis over how to handle backsliding. Since Fidesz won power in Hungary 2010, re-wrote the constitution and concentrated power in the hands of Viktor Orbán, democratic backsliding has become a big question in the EU. How far the can a member state be allowed to go back on the commitments it signed up when it joined the EU? Until Jarosław Kaczyński’s Law and Justice party won power in late 2015, the answer seemed to be ‘quite far’. With the European People’s Party reluctant to criticise one of its members, Orbán had considerable room for manoeuvre. But the Poles defied the EU openly. As prime minster Beata Szydło put it in November 2016: compliance with the Commission’s rule of law recommendation was ‘incompatible with the interests of the Polish state’. A year later the Commission lost patience, and invoked Article 7. But what is backsliding, and how widespread is it? The TransCrisis project answers this question by defining and mapping backsliding in the EU. The academic literature on backsliding is still developing, but three themes stand out: backslidings as a reversal of democratization; backsliding as oligarchic state capture; and backsliding as ‘bad governance’. In the EU context, backsliding could be defined member state policies that contravene the EU’s fundamental laws and values. Even limiting this to policies that violate the values set out in Article 2, it is clear that backsliding involves a broader set of problems than Kaczyński and Orbán’s ‘illiberal democracy’ projects. The chart below provides a simplified snapshot of backsliding in the decade following the financial crisis in three different domains: the rule of law, corruption and social equality policy. The member states are arranged by date of accession to the EU. Low bars indicate some problems related to backsliding (or in the case of corruption, long-term inability to live up to corruption control expectations); medium height bars indicate a degree of backsliding; and high bars indicate substantial backsliding. The chart does not capture change over time, but all the data and time-series are available in two TransCrisis policy briefings: one on mapping backsliding up to 2015, and one on case studies carried out in 2016 and early 2017. 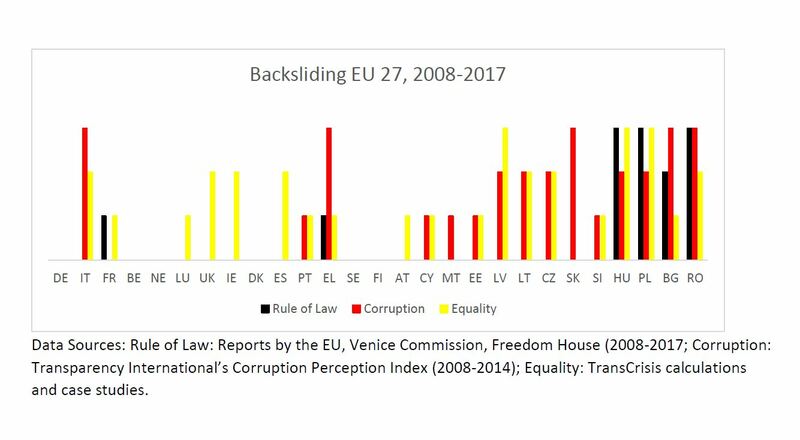 The data on backsliding on the rule of law are drawn from reports by the European Commission, the Venice Commission and Freedom House, as well as country case studies. Cases classified as ‘some backsliding’ include France (criticised by the Commission over its 2010 deportation policy aimed at EU citizens of Roma ethnicity) and Greece (low and declining scores on the Freedom House Rule of Law index). Bulgaria’s medium score reflects negative Venice Commission opinions combined with low and declining scores on the Freedom House Rule of Law index. The classification of Poland, Hungary and Romania as cases of substantial backsliding is based on their negative assessment by all of the above institutions, as well as in-depth case studies. The data on corruption are drawn from Transparency International’s Corruption Perception Index, between 2008 and 2014. The TI CPI scores draw on perceptions of corruption rather than ‘solid’ data on actual occurrence of corruption. This captures low-level administrative corruption better than the type of ‘grand corruption’ that occurs when corrupt elites capture the state apparatus; and is not sensitive to capturing change over time. The group of lowest-scoring countries over the 2008-2014 period includes Bulgaria, Greece, Romania, Slovakia and Italy. Five others feature slightly higher average scores (and improve somewhat over the decade): Latvia, Lithuania, the Czech Republic, Poland and Hungary. The middle group in the EU, going by their average CPI scores, includes Cyprus, Estonia, Malta, Slovenia and Portugal. However, more in-depth investigation of for example government contracts suggests that even as administrative corruption stagnates or declines, grand corruption might be on the rise in countries such as Croatia, Slovenia and Hungary. Grand corruption is also documented in Slovakia and Romania, whereas it seems to be on the decline in the Czech Republic, Estonia, and Latvia. The classification of states in terms of backsliding in three aspects social equality policy – gender, race, and disability – is based on data on agencies and policies collected for the TransCrisis project in 2016 and in-depth case studies of Poland, Hungary, Romania, Spain and the UK. Until 2015, only Hungary and Latvia showed unambiguous backsliding in all three areas; but at the end of that year the Polish government moved swiftly to reverse policy trends in all three. The Czech Republic, Ireland, Lithuania, Romania, Spain and the UK feature backsliding in two out of three equality policy areas, while another eight states have seen some form of backsliding with respect to either gender, race, or disability. The TransCrisis project analysed backsliding both as a set of crises in its own right, and as a potential source of a systemic crisis for the EU. The organisation’s capacity to detect and sanction backsliding is limited. More importantly, so is its political will. When it comes to policies on social exclusion, the EU’s limited capacity and will is unlikely to make matters worse. In terms of corruption control, however, there is a danger that failure to recognise the seriousness of the policy problem and take more decisive action might leave the EU with a blind spot to real a threat to its economic and political system. But it is democratic backsliding in the rule of law that poses the biggest potential threat to the EU: Tough action against Poland and Hungary, for example by linking EU funding to compliance, could alienate several of the eastern member states. Failure to act could undermine the north-western states’ willingness to pay, or even to recognise the integrity of backsliding states’ legal systems. Kicking the debate on democratic backsliding into the long grass might be tempting, but will only make the problem worse. The blog summarises the work on ‘backsliding’ as part of the TransCrisis project. The author is writing in a personal capacity and the views do not represent the TransCrisis consortium as a whole. How can the economic dialogue be strengthened? The European Commission’s recent roadmap for completing the European Monetary Union (EMU) suggests increased involvement of parliaments in EU economic governance. For example, the Commission proposes to formalise the economic dialogue, create a European Minister of Economy of Finance accountable to the European Parliament (EP), and integrate the Fiscal Compact into EU law. These initiatives seem to be a godsend to the EP, who for the most part played second fiddle in the EU’s response to the sovereign debt crisis due to the executive-dominated approach to crisis resolution. The question is to what extent these proposals thicken the EMU’s thin democracy without changing the ways in which existing oversight mechanisms work. In a recent paper, I examined how actively and diligently MEPs use the economic dialogue. This was done through a systematic analysis of all the hearings involving member states in the EP’s Committee on Monetary and Economic Affairs (ECON) between 2012 and 2016. The economic dialogue was invented to increase transparency and accountability in EU economic governance and makes it possible for the EP to publicly discuss the decisions taken by executive bodies (e.g. the Council system, Eurogroup, Commission, and national governments). It is questionable if the economic dialogue can fill the gap of limited parliamentary accountability in economic governance as along as the very structures are not changed. As also highlighted by other researchers, it is unclear who should be held accountable for the decisions taken in the EU’s reformed economic governance system, particularly concerning the European Semester. This is because supranational political authority is suspended between the collective of national governments in the European Council and Council, and the Commission. The European Semester is an iterative step-by-step process where it is difficult to assess when the significant decisions are taken and by whom. At every step of the process, it is possible for the actors involved to attribute their policy choices to the conditions set at the previous step. The Commission, for instance, can only present its decisions as the implementation of the rules set by national governments. At the same time, the member states are not politically accountable as a collective at the EU level and in practice often support the Commission’s position. This makes the principle that ‘democratic control and accountability should occur at the level at which the decisions are taken’ rather difficult to adhere to in practice. Aligning the dialogue better with the different stages of the European Semester may be a step forward in including the EP better in decisions taken. The format of the economic dialogue does not allow for in-depth discussion. Hearings consist of three consecutive parts: (1) an approximately ten-minute presentation by the invited minister (usually the minister of finance or economics), (2) questions from MEPs from a set speaker list, and (3) a catch-the-eye session. For each MEP taking the floor, there is five minutes allocated to ask a question and receive an answer before the floor is given to someone new. It is questionable whether these five-minute slots work in practice as there is rarely time to pose follow-up questions. This makes the nature of the economic dialogue more of a barrage of questions and answers rather than a ‘true’ dialogue. The lack of follow-up questions does not allow MEPs to really challenge ministers as there is no time to contradict the answers given, ask for elaboration, or point out contradictions. If accountability is about asking for explanations and justification of political choices made – rather than pure information provision – then the economic dialogue still needs to go some way before it develops into a proper scrutiny mechanism. A better organisation and coordination of the issues raised by the political groups might allow for more focused hearings and a deeper exploration of issues. Only few MEPs ask pertinent questions to member states, that is questions that go to the heart of the member state’s economic and financial problems. Many of the questions asked depart from the legal framework for the dialogue laid down in the Six-Pack and Two-Pack and concern broader economic issues often not related to the specific situation of the country under scrutiny. Better preparation on part of the MEPs might help to focus the questions better. The above suggestions show that strengthening the economic dialogue needs to go further than only formalising the procedure. It is important to remember, however, that the dialogue is still a young initiative and is part of an ongoing learning process. The author is writing in a personal capacity and the views do not represent the TransCrisis consortium as a whole. Political conditionalities in cohesion policy: a way to stop democratic backsliding? Democratic backsliding has become a top issue in European politics, not just among leaders who have started to realise recently that inaction might undermine the credibility of the European Union, but also in the international media as for now it seems evident that the construction of illiberal regimes in Hungary and Poland is fuelled by EU money. The governing parties Fidesz and PiS are not ’only’ accused of the systematic disassembling of the rule of law and hollowing out the democratic institutions. They are also accused of boosting the economy through contracts handed out to favoured insiders, thus they are largely financing their anti-democratic rule from EU funds. In terms of going back on the commitments to the fundamental values of the EU, it has already turned out that the EU institutions lack the necessary legal instruments to tackle systemic threats to democracy. Infringement proceedings can target specific legal issues but they are not an appropriate tool to address challenges to the wider democratic framework. At the same time, the EU’s Rule of Law mechanism (the so-called Article 7 TEU procedure which allows for the (unanimously supported) suspension of voting rights of member states found to be in ’serious and persistent breach’ of EU values) is likely to go nowhere in the case of Poland, since the governing PiS party can feel safe that invoking Article 7 will not lead to sanctions due to Hungary’s veto. While Poland ignores the European Commission’s Rule of Law procedure, there has not been similar action against Viktor Orbán’s government in Budapest. This means that the EU tries to sanction the follower, but not the trendsetter. The Orbán government started to move towards a soft autocracy five years earlier; in other words, the Hungarian ’situation’ is in a much more advanced state, and the tools applied by the Hungarian government have also been more diverse. The main reason behind the inaction against Hungary is a party political one: Orbán’s Fidesz is a valuable member of the leading centre-right party family, the European People’s Party (Fidesz contributes 12 mandates to the EPP group in the European Parliament), while PiS is not and their main domestic rival (PO) is. This fact alone ensures that Fidesz avoids the same treatment that PiS receives. Based on the EU level responses to backsliding in these two countries, the limits of the EU’s legal capacity are obvious – and leaders in Hungary and Poland are well aware of them. It is therefore hardly surprising that the brainstorming has intensified in Brussels and other European capitals about finding new and more efficient instruments to deal with current and future backsliding. The ideas floating around are formulated in a language that illiberal leaders also understand: the language of money. There are two major developments at the EU level that favour such debates: Brexit and the planning of the next Multiannual Financial Framework, the EU’s budget. From a budgetary point of view, Brexit means that the EU loses a net contributing country. This either leads to a smaller EU budget or member states need to be persuaded to increase their payments. Since the latter seems to be the likelier scenario during the EU budget negotiations, it is vital that all European leaders, from Germany to Cyprus, can explain to their electorates that their money is delivering public goods rather than serving private interests. As a consequence, new tools to eradicate waste and abuse will be important. In this context, the widely reported stories about István Tiborcz, Viktor Orbán’s son-in-law, and Lőrinc Mészáros, the prime minister’s friend and mayor of Felcsút, the village where Orbán was born, make it all the more likely that new political conditionalities in cohesion policy will be introduced. In the Tiborcz case, the EU’s anti-fraud office, OLAF, called on Brussels to recoup €40m after it found ’serious irregularities’ and a ’conflict of interest’ following a two-year investigation into EU-funded street-lighting contracts. A former gas fitter, Mészáros now owns hundreds of companies, in construction, real estate, media, wine, farming and beyond. According to estimates by the Hungarian transparency website Átlátszó, 83 per cent of Mészáros family companies’ earnings comes from EU sources. At the same time, the Hungarian government has attacked Brussels for years, and it even launched a ’Stop Brussels’ billboard campaign last year. It is unlikely that net contributors will continue tolerating this kind of behaviour in the next budgetary cycle. The wish of several member states to link EU funds to the Community’s fundamental values is understandable. However, it is far from evident how a direct link between EU money and rule of law can be established in practice. It is a huge challenge and may take several years to decide the exact point at which a country crosses the red line in terms of the quality of democracy. Even if there was agreement on what ’quality of democracy’ means, expect endless debates in each individual case should this link between democracy and finance be applied in the future EU budget. What seems to be more feasible is the establishment of an EU prosecutor with powers beyond OLAF, and linking the EU funds to joining the European Public Prosecutor’s Office for all EU member states. Another potential way to prevent the abuse of EU funds would be a more active role of the European Commission in the allocation of structural funds. More direct management by the Commission would mean that EU funds would be distributed without the involvement of local networks in cases where there is a strong suspicion of corruption. According to the current rules, the Commission can suspend programmes when it finds irregularities, but the member state does not lose the resources. The combination of the threat of losing funds and transferring them to the direct management by the European Commission, and an EU prosecutor who would investigate fraud and corruption cases involving cohesion and agricultural funds, has the potential to become a powerful policy mix. These two instruments could contribute to stopping financing the oligarchs of illiberal democracies, and increase the probability of reaching the original goal of cohesion policy: to help poorer regions and countries catching up. András Bíró-Nagy is Co-director of Policy Solutions and a Research Fellow at the Hungarian Academy of Sciences (MTA TK PTI). The author is writing in a personal capacity and the views do not represent the TransCrisis consortium as a whole. Democratic backsliding has become a hot topic in the EU, not just because some states pursue policies that contravene their commitments to democracy and the rule of law, but because the EU is poorly equipped to deal with it. But what does democratic backsliding actually mean? This blog offers a short answer: the twelve institutional aspects of democratic backsliding. The comparative politics literature covers three distinct aspects of backsliding – backsliding as a process that halts or reverses democratization; backsliding as an ideological alternative to liberal democracy; and backsliding in terms of bad governance. The notion of backsliding as a process draws on the literature on democratic transition and consolidation, and involved analysis of dynamics that might halt or reverse these processes. Key features include decline in the rule of law and democratic practices, as well as concentration of political, social and economic power and the hollowing out of democratic institutions. The notion of backsliding as a normative alternative to liberal democracy is linked to the classic ‘democratic dilemma’ – the balance between majority rule and minority rights. Its draws on the populist tenet that the true representatives of the people should rule more or less unconstrained. This brings into question the importance of independent media, civil society and separation of powers, inasmuch as the role of all organizations should be to support the executive. The notion of backsliding in terms of bad governance is in many ways a mirror image of the academic debates about good governance. Corruption, rent seeking, abuse of public procurement, and the establishment of an oligarchy are classical elements. This can be extended to policies that directly contravene individual and human rights, and in the EU context, core EU values. The result is various forms of hybrid regimes. In practice, the strategy of democratic backsliding involves four key elements in terms of political institutions – centralization of power, control of the electoral process, state capture, and limiting civil society. Successful pursuit of these goals can blur the boundary between party and state, to the extent that a façade democracy may be maintained by way of elections and institutions that formally resemble those of liberal democracies, but in practice amount to a one-party regime. The following twelve paragraphs elaborate on the most important aspect of these four sets of institutional changes that a party-leader who has won an election might embark on to build an illiberal democracy. 1. The most urgent element of centralization of political power for an aspiring authoritarian leader is centralization of executive power by way of controlling the legislature. In the long term this might include changes to the legislative structure (e.g. elimination of an upper chamber); in the short term perhaps the easiest measure is curtailing consultation, debate, and scrutiny of parliamentary legislation, or limiting parliament’s ability to hold the executive to account. 2. The second, somewhat less urgent but equally important, step is to exercise control of the judiciary. Changing the personnel in the constitutional court and/or the court’s competence, power, or decision-making procedures is the most controversial type of measures. Other, less visible, forms of control include changes to the personnel, procedures and remits of the ordinary courts, or simply ignoring court rulings. 3. The most effective, but also the most difficult, aspect of institutional centralization is the adoption of a new constitution. If done competently (and unilaterally), with high thresholds for constitutional reform, this can lock-in the ruling party’s policy and personnel preferences for the foreseeable future – even in the event of a loss of power. 4. The whole point of illiberal democracy, however, is that the ruling party does not lose the next election to the ‘enemies of the people’. Re-designing the electoral system, or adopting a new tailor-made electoral law could help secure this goal. 5. But electoral reform is rarely enough. Unless it is banned out-right, a competent opposition might respond to the incentives of the new electoral system. It may therefore be necessary to allow for periodical review of the electoral law before each election (by a government-controlled body), e.g. re-districting and rules about candidate/list eligibility. 6. The third key element of institutional manipulation in the quest of re-election concerns amendments of the regulations for electoral campaigns, including campaign finance and political advertising. 7. Once victory is secured, a central tenet of illiberal democracy is that all power resides with the leadership. Democratic backsliding usually involves both an effort to capture the state and build an oligarchy. The most important measures include corruption, or more specifically a shift from ordinary corruption to grand corruption; from bribes in an open system to a closed system where public procurement, tax breaks or regulatory rules are designed to benefit the oligarchy. 8. Controlling the state apparatus also involves control of the ‘arms-length’ agencies of the state, such as the national audit office and regulatory authorities. Most liberal democracies are based on a number of independent agencies with a high degree of credibility. In the EU system this also extents to the central bank. 9. This third element of democratic backsliding and state capture involved the other levels of the state, including local and regional government – and, in the EU, representation at the EU level. 10. Unlike the classic authoritarian recipe (eliminating opposition), the illiberal democracy model involves limiting or marginalizing independent voices. Control of the mainstream media – print, broadcast and on-line – is perhaps the most important issue. Besides direct and active state ownership, media regulation and oversight is the most direct tool. But oligarchic ownership and political direction of state advertising to supportive outlets can also help. 11. In the same vein, limiting the freedom of action of independent interest groups and NGOs is a common strategy for both authoritarian states and backsliding democracies. In the EU context, this includes efforts to limit, penalize or stigmatize foreign funding – whether private or from international organizations. 12. Finally, in the long term, illiberal democracy also involves silencing independent voices that affect politics more indirectly, by way of culture and education. The list of civil society organizations that can be brought directly or indirectly under political control is almost endless, including e.g. universities, schools, theaters, sports associations, churches etc. The point here is not to set out an exhaustive list of institutional measures that define democratic backsliding, but rather to focus on a limited set of key institutional changes that – if carried out with due care and attention – limit the operation of liberal democracy to the extent that the regime could be characterized as backsliding on democratic commitments. Mild versions of many of these types of reform can be found in ordinary liberal democracies, but the higher the number that is combined and the more extensive the reforms, the more solid the basis for the backsliding diagnosis. Moreover, these reforms must be evaluated in context. A remarkable feature of the recent illiberal challenge to the EU system has been its open attack on the whole idea of the open society, individual liberties and the rule of law – as well as international cooperation. Institutional reforms are supported by both words – the narrative about national, populist, illiberal democracy – and action. Each of the twelve sets of reforms include a raft of abuses of power by way of e.g. bending and stretching the rules on emergency measures, impeaching or arresting opponents, legislating against opposition parties, harassing media or civil society, abusing audit and inspection regimes, and – of course – using the oligarchy’s economic power to support the governing party and weaken the opposition. Even the occasional bit of political violence might be called for. Democratic backsliding is most easily identified in the form of institutional change – but illiberal democracy cannot work without persistent abuse of power and a good story to cover it. The author is writing in a personal capacity and their views do not represent the TransCrisis consortium as a whole. Sleepless in Sofia: Can Bulgaria save Poland from Article 7? It is the Bulgarians’ turn. When the Bulgarian government took over the EU’s rotating Presidency of the Council on 1 January, it was confronted with both a potential crisis and a golden opportunity to clean up the image of the country known to be among the poorest and the most corrupt among the EU’s member states. Two hot potatoes – Brexit and Poland – feature prominently on the Bulgarian Presidency’s agenda. Of the two, the Polish question is likely to prove more difficult. Last December, the Commission gave Warsaw three months to reform its plans for judicial reform because these were found to present a risk that the rule of law might be undermined. At a ministerial meeting on 27 February the EU member states will have a first discussion with Poland on this matter – under Bulgarian chairmanship. But Bulgaria would prefer not to have to deal with the Polish case at all. So far, the Bulgarian government has failed in its attempts to postpone discussions on the Polish case, and kick this particularly tricky ball into the long grass. The minister for the EU presidency, Lilyana Pavlova, observed that the case could easily drag into the second half of 2018, when Austria takes over the Council presidency. But this was not greeted with enthusiasm in Brussels. The Commission continues to emphasise the importance of the three-month deadline that expires in March. The Bulgarian government – like some of the other Central European member states – is caught between its sympathy for a fellow post-communist state and its broadly pro-EU stance. This Balkan state, which joined the EU eleven ago, has not yet managed to reform its own judicial system and would rather avoid high speed and sharp turns on the Polish question. The prime minister said that rule of law issues are ‘so vague’ and difficult to measure that it is better not to bring them before the Council. Officials in Sofia have therefore expressed considerable reservations about the threat to punish Poland over democratic backsliding, and emphasized the challenges involved in forcing a decision at the EU level. The first vote under Article 7 will be a decision whether there is a ‘clear risk of a serious breach’ of the rule of law in Poland. This requires the support of a four-fifths majority of member states, which means that six states (not counting Poland) voting no or abstaining is sufficient to block the decision. Hungary has promised to veto any subsequent vote to determine an actual breach, which requires unanimity. But if the EU cannot even muster the 22 votes needed to determine a risk of a breach, this could seriously undermine the EU’s credibility – especially during the negotiations on the Multiannual Financial Framework. Last summer, Swedish Prime Minister Stefan Löfven suggested that countries that do not follow EU rules ought to be punished by suspending EU funding. At the time, he referred to Poland and Hungary’s refusal to accept refugee quotas. Since then the theme of linking EU funding to compliance with the EU’s fundamental rules and values has since gained traction. It has received some support from several (western) member states. Budget Commissioner Günther Oettinger has also publicly commented on the possibility of establishing conditionality as part of future funding arrangements. In the light of the Norwegian government’s successful confrontation with Hungary over the use of European Economic Area funds in 2014-15 – in which Norway suspended funding until Budapest stopped harassing EEA Grant-supported NGOs – this idea could prove attractive to the EU’s net contributors. But it would exacerbate the developing political cleavage between the north-west and the south-east in the Union. Bulgarian PM Boyko Borissov’s immediate worry is that the EU member states might be called upon to vote on whether Warsaw breaks rule-of-law standards. He argues that this would create a ‘dangerous precedent’, and that such a vote should be avoided: ‘If we have to go voting, we will have sleepless nights to vote. I hope we do not have to face this’. Sofia therefore needs a compromise that will fudge the issue. On the one hand, the message is: ‘Poland should be listened to’ (Foreign Minister Ekaterina Zaharieva). On the other hand, Bulgaria hopes that its ex-communist fellow Poland will find a way to comply with the EU law. And Bulgaria is not the only state in this position. Hungary openly supports Poland, and the Croat government has made sympathetic noises. The Commission’s recent warning to Bucharest about rule of law and corruption (24 January) might not make Romania too keen to go after Poland. And in the middle of Brexit negotiations, might London abstain in order not to lose friends in the east? Might a left- and right-populist triumph in the Italian elections on 4 March tip the balance? In any case, Vienna, Prague and Bratislava all have mixed attitudes to their ‘illiberal democracy’ neighbours. Bulgaria will therefore play the role of balancer in the next 6 months. The Bulgarian Presidency is run under the theme ‘United we stand strong’. These words also feature on the coat of arms of the Republic of Bulgaria. The Presidency has promised to work on unity among the member states and the EU institutions. Its message needs to be ‘remain neutral and impartial’. If the Polish question comes to a vote – where abstaining will count in favour of Warsaw – that might well prove impossible. But if Bulgaria manages to postpone the vote, the EU could be facing an even bigger crisis in the shape of the future budget. The authors are writing in a personal capacity and their views do not represent the TransCrisis consortium as a whole. Czech elections – let alone Czech presidential elections – do not always command international attention. Compared to Hungary and Poland – where the radical effects of the victory of populist right-wing parties in parliamentary elections have given new meaning to the term ‘democratic backsliding’ – democracy in the Czech Republic is not under threat. However, the current presidential election (first round January 12–13; run-off on January 26–27) merits attention both on the grounds of the effects it might have on domestic politics and because of its potential wider impact on European Union politics and on European security questions. Nine candidates ran in the first round, and as expected, the incumbent president Miloš Zeman finished first with 38.6 percent. Zeman did not do quite as well as some of the polls suggested. Zeman’s strongest rival, Jiří Drahoš, the former head of the Czech Academy of Sciences, finished second with 26.6 percent. Polls give Drahoš a good chance of winning the run-off. Unlike Schwarzenberg in 2013, he is acceptable in wider circles. Of the seven candidates who did not make it to the second round, three non-partisans won between 8.8 and 10.2 percent each. The only experienced politician besides Zeman, former prime minister Mirek Topolánek, received only 4.3 percent. All four have publicly endorsed Drahoš for the second round, and one of them (Michal Horáček) even offered Drahoš his prepaid billboards. However, much depends on Drahoš’ ability to match Zeman in (two) TV debates and to mobilize (new) voters. Turnout in the first round was 61.9 percent; and highest in Prague, where Drahoš won. It is expected that the campaign will become uglier in the run-up to the second round. Why is it important who wins the run-off? The present impasse in Czech politics means that the next president may have more influence on the Czech political scene than his limited formal powers might suggest. This week the minority government of billionaire prime minister Andrej Babiš, in office since December 6th, 2017, lost a vote of confidence in the lower house. Having won the parliamentary election of October 2017, his party, the centrist populist ANO, is the biggest party with 78 seats in the 200-strong lower house. However, the government only received the backing of the ANO, and therefore resigned on January 17th. As if this was not enough, the lower house voted to strip Babiš and his first vice chairman Jaroslav Faltýnek of their parliamentary immunity. The two MPs have been under police investigation for subsidy fraud against the EU in the Stork’s Nest case. In 2008 the Stork’s Nest farm and hotel complex received a 50 million crown EU subsidy intended for small and medium-sized companies. Technically it was at the time owned by family members of Babiš (his two grown children and the brother of his current wife), but before and after this the Stork’s Nest was owned by a subsidiary of Agrofert, and therefore not eligible for EU subsidies. The case has also been investigated by OLAF, the European Anti-Fraud Office. Babiš denies any wrongdoing. This case is part of the reason why it has been difficult for Babiš to form a majority government. To do so, he needs the support of at least one other party. Babiš stated right after the election that he would prefer to govern with the Civic Democrat ODS (25 seats), also because the two parties – in his view – are politically close. The invitation was flatly rejected by ODS chairman Petr Fiala. A second possibility would be to renew the 2013–2017 coalition with the Social Democrat ČSSD (15 seats) and the Christian Democrat KDU-ČSL (10 seats). Both are willing to negotiate, but neither party will accept as a member of the government, let alone prime minister, a person who is under criminal investigation. As for the rest, Babiš declared already before the election that he would not govern with the extreme left (the unreformed Communist Party KSČM, 15 seats) or the extreme right (Tomio Okamura’s SPD, 22 seats). ANO nevertheless made a deal with these two parties to make sure that Radek Vondráček from ANO was elected speaker. The two small parties on the centre-right, the conservative TOP09 and the centrist Mayors (13 seats combined) ruled out future government cooperation with ANO even before the election. Finally, the Pirate Party (22 seats) has decided not to support or tolerate an ANO government. It is difficult to imagine a majority government without ANO, since neither of the parties wants to govern with KSČM and SPD. In this complicated parliamentary situation, the outcome of the run-off election on January 26–27 may well make a difference. According to the Czech Constitution, the president appoints the prime minister, and on his proposal, the rest of the ministers. However, if the government does not win a vote of confidence in the lower house within 30 days, it must resign. This is where the Czech Republic is now. President Zeman has promised Babiš a second go, but to put pressure on the parties, Zeman has demanded assurances that a majority of at least 101 MPs will support the new government. In the meantime, the current Babiš government will continue as a caretaker government. If Zeman wins the run-off, this situation can go on for a long time – potentially to the end of the election period. Already in 2013 Zeman showed his willingness to stretch the constitution by keeping a government in office that did not enjoy the confidence of the lower house. Moreover, he is adamant in his rejection of early elections. If Drahoš wins, Zeman has to act before his period ends on March 8th. If he decides to give Babiš a second chance, and he succeeds in forming a majority government, there is little Drahoš can do. If this government also fails to win the vote of confidence, the speaker of the lower house (Vondráček from ANO) decides whether Babiš (or somebody else from ANO) will get a third chance. If also the third attempt fails, the initiative goes back to the president. Drahoš has spoken up against appointing a prime minister who is charged with crimes, and in contrast to Zeman, he most likely will call early elections if also the third attempt fails. If all parties but ANO agree, the lower house may theoretically dissolve itself (with a 3/5 majority), but this is not very likely. But the Czech presidential vote may also have reverberations outside the country. The contest between Miloš Zeman and Jiří Drahoš reflects a political cleavage that runs through many European party systems and has gained salience since the financial crisis. The Economist labelled this a contest between ‘drawbridge-up’ national and populist protectionists on one hand, and liberal ‘drawbridge-down’ parties. Since 2010, the right-populist Fidesz has taken ever-tighter control of Hungarian politics, to the extent that its commitment to liberal democracy is widely questioned. In Poland the PiS lost no time in copying Fidesz’s ‘illiberal democracy’ project after its 2015 electoral victory. In 2016 the nationalist critics of open borders triumphed in the Brexit referendum and the US presidential election, but failed in the Austrian presidential election. In 2017, the French and Dutch elections saw the liberals defeat right-populist challengers, which the German elections weakened Angela Merkel and the Austrian elections brought a populist coalition to power. On 4 March, the Italian election will pit a centre-left liberal alliance against populist Eurosceptic rivals on both the left and the right in a three-way race. The first international dimension of the Czech election is therefore that it is one of a series of electoral tests between liberals and populist nationalists. In the Czech, like the Hungarian and American, case this also involves a Russian dimension. If Viktor Orbán is – as a US congressional report on Putins’s Asymmetric Assault on Democracy in Russia and Europe suggests – Vladimir Putin’s closest ally in the EU, Miloš Zeman comes a close second. The Czech president has pushed for the EU to accept the Russian annexation and explore the possibility of some form of compensation for this ‘fait accompli’. Like the Hungarian and Slovak prime ministers, Zeman has repeatedly criticized the EU sanctions on the Russian financial, energy and defence sectors. Although his foreign policy powers are limited, Zeman’s re-election could reduce somewhat the prospects for the renewal of the sanctions when these come up for renewal in the summer. Perhaps more worryingly, the presidential election has already given rise to fears about ‘fake news’ and Russian interference. Regardless of its limited potential effect on foreign policy decisions, this electoral contest is likely to go down in history as another chapter in Russia’s cyber-attacks on the West. The second international dimension concerns the future of the EU. The Czech presidential election takes place in a political situation where the Central European states are very divided over the Hungarian and Polish governments’ ‘backsliding’ on their countries’ commitments to liberal democracy and the rule of law, and the norms and laws they signed up to as members of the European Union. Again the formal powers of the Czech president are limited. It will be the government that decides on how to vote on any censuring of Poland. So far, only Hungary’s Fidesz has threatened to veto sanctions against Poland under the European Union’s Article 7 over breach of fundamental values of the EU (in this case, the rule of law). Bulgarian prime minister Bouko Borisov (the chair of the EU Council of Ministers for the first half of 2018), said he ‘would lose sleep’ over the question. Some others, such as Austria’s conservative-populist government (which is close to Fidesz) and the Croat government, are playing their cards close to their chests. While Hungarian prime minister Viktor Orbán had made it clear that he considers action against Poland an attack on all of Central Europe, his Czech and Slovak counterparts have been more careful to avoid too close association with the EU’s ‘backsliding’ black sheep. Under Article 7, a four-fifths majority of member states (i.e. 22 states) is required to determine the ‘clear risk of a serious breach’ (after that, unanimity would be required to determine ‘the existence’ of such a breach, which could then lead to sanctions). Could a strengthened Zeman-Babiš team shift the balance in the Visegrád 4? And tip the balance if the Italian election in March propels right- or left-wing populists to power, and/or the uncertainty around Brexit makes the UK abstain? The answer will depend on how the Czech domestic politics game plays out after the election. When the European Parliament voted on a resolution to criticise Fidesz over its government’s democratic backsliding in May 2017, the fault line in the European People’s Party between the parties that protected their errant sister party ran from north-west to south east: the Italians, Spaniards and Germans joined the Czech, Slovak, Hungarian and Balkan conservatives in closing ranks around Fidesz. But both Babiš and Jiří Drahoš are committed to a pro-EU and Atlanticist foreign policy. More to the point, Babiš has explicitly distanced himself from the Polish and Hungarian governments’ efforts to centralise power and limit the rule of law. In the event of a Drahoš-victory, the prospects for the Czechs moving closer to Poland and Hungary in a ‘backsliders alliance’ are therefore weak. But in the event of a Zeman victory – and especially one that is associated with Russian interference – the waters could become muddier. Zeman has already demonstrated a tendency to disregard constitutional convention, notably when he appointed a ‘technocratic’ caretaker government in 2013 and delayed new elections despite its lost vote of confidence. Although the Czechs are unlikely to follow the Polish and Hungarian path, a shift closer to their two illiberal regional partners could have a negative effect on the EU’s will to confront democratic backsliding. The Commission can count to 22. With Budapest and Sofia sympathetic to Warsaw, and question-mark hanging over Zagreb, Vienna and London – and possibly post-election Rome – even a degree of uncertainty about the position in Prague might be enough to prevent the next step toward a censure of Poland. In what promises to be a turbulent year for the EU, political developments in the Czech Republic could become important for Central Europe’s future in the EU. The prospect of transboundary crises forces governments to reassess their crisis management toolbox. In recent years, modern systems have proven frightfully sensitive to disruptions that originated in some unrelated faraway domain. The financial crisis, the flood of immigrants, the threat of cyber warfare – these are all examples of transboundary crises. These crises do not respect borders and create daunting challenges for governance. The TransCrisis consortium is investigating these challenges and exploring how governments can prepare for transboundary crises. It is clear that transboundary threats require new forms of governance. Time-proven processes and ways of organizing are no match for the transboundary crisis. Governments need to work across boundaries to create the crisis management ‘capital’ that is required to minimize the impact of these events. What might that ‘capital’ look like? According to our perspective, this includes all the organizational means, processes, and experiences that are relevant to the fulfilment of the strategic tasks that typically demand attention in any large-scale crisis response (these tasks are derived from Boin et al, 2016). 1. Early detection: recognizing that something is afoot that may have an impact in one’s domain. 2. Sense-making: understanding what is happening during the crisis. 3. Critical decision-making and coordination: recognizing which decisions must be taken now, and making sure these decisions are made and implemented. 4. Crisis communication: explaining to the public what is happening and what people should do (and should not do). 5. Accounting: explain to relevant institutions how the crisis was handled and why it was handled that way. The underlying assumption is simple: the better these tasks are handled, the better the crisis response is likely to be. If one accepts this assertion, several questions arise: What do we have available? Is our organization ready to fulfil these tasks? What, exactly, should we be looking for to answer these questions? It is not easy to assess an organization’s crisis preparedness, especially if you do not know what to look for in an organization or in a sector. The TransCrisis consortium has created a tool to do exactly that. We designed a survey tool that helps to ask the right questions and quickly gauge the crisis readiness of an organization or set of organizations. It measures the transboundary crisis management capital of an organization. The Survey consists of questions that should be answerable without deep knowledge about the organization. The answers provide the input for a ‘performance dashboard’ that one can use to track the organization’s crisis management capital over time. The surveyor is invited to provide a grade for each question, which allows for an overall score. The questions and the scores generate three types of input: on preparation, on available means, and on the legitimacy base an organization or policy sector needs to perform well during a crisis. These are the indicators of the dashboard. a) Take a crisis, identify the organizations that play(ed) a role in the response, and score their capacities to deal with that particular crisis. b) Take an organization and assess its capacities to deal with a crisis. c) Take a policy sector, identify potential risks, identify the organizations that play a role in the response, and score their capacities to deal with crises that may flow from those risks. Step 2: Determine the weight of the three performance categories and assign “earnable” points for each question. Step 3: Collect data to answer the questions and complete the dashboard. The Survey Tool can be accessed here and also provides for illustrations drawn from TransCrisis research. This tool serves the needs of both practitioners and academics. For instance, an agency director can use it to assess the organisation’s readiness level to respond to transboundary crises. The survey will help to identify the capacities the organisation is lacking in order to inform strategic decisions on budget and training for crisis management. For researchers, this tool helps to compare the readiness and performance of organizations that may be involved in transboundary crisis responses. To be truly effective, this tool requires further fine-tuning by being tested against known failures and successes. For that reason, we invite practitioners and academics to use this tool and provide us with their feedback. Arjen Boin, Paul ‘t Hart, Eric Stern and Bengt Sundelius (2016). The Politics of Crisis Management. Cambridge University Press (second edition). The authors are writing in a personal capacity and their views do not represent the TransCrisis consortium as a whole. The authors are based at Crisisplan BV in Leiden, The Netherlands (www.crisisplan.nl). On December 20th, 2017, the European Commission formally posed the Polish Question: Can the EU tolerate that a member state breaches the Union’s fundamental laws and values? At some point in 2018, under the procedure laid down in Article 7 of the Treaty of the European Union, the other 27 member states might well be called upon to answer this question; first by a four-fifth majority vote on whether Poland is indeed in ‘clear breach’, and later – if applicable – by unanimity on whether to impose sanctions. The Polish Question is about much more than the Polish government’s effort to limit the independence and power of its own judiciary. Ever since Vladimir Mečiar’s efforts to centralise political power in Slovakia in the mid-1990s (which the EU dealt with by relegating the country to the membership slow lane, until Mečiar lost power in 1998) and the right wing populist FPÖ joining the Austrian government after the 1999 election (when the other EU states responded by ‘monitoring’ the coalition), the EU has reluctantly prepared to deal with the possibility that a less than fully liberal democratic party might one day come to power in one of its member states. Article 7 provided the means for censuring such a government; Article 50 was designed to give an authoritarian state an exit option. Since the Hungarian right-populist Fidesz won absolute power (including the two-thirds majority needed to rewrite the constitution) in 2010, that country has introduced a number of laws and measures that push at the boundaries of EU law. Journalists, politicians and academics have introduced the term ‘backsliding’ to capture the state’s gradual going back on its commitments to the fundamental values of the EU, and indeed to (constitutional) liberal democracy. Prime minister Viktor Orbán chose the term ‘illiberal democracy’ to sum up his idea of an alternative political system. So why has it become a Polish Question, and why has the Hungarian question remained lower-case? Part of the answer is that Hungary could be dismissed as an accident or a coincidence (a long time after the Slovak and Austrian false alarms), and that in any case it was a small country. When the new Polish government took action against its own judiciary in late 2015, backsliding began to look like a pattern. And perhaps as importantly, Fidesz enjoyed the protection that its membership of the European People’s Party offered, whereas PiS’ main domestic rival is an EPP-member. But the Commission’s taking action against Poland also puts the pressure on Hungary. The question is whether other EPP members will continue to back Fidesz if Orbán lives up to his promise to veto any action against Poland. If the Hungarian prime minister’s close relationship with Bavaria’s Christian Democrats (the CSU) and Austria’s Sebastian Kurz is anything to go by, this issue could divide European conservatives (and the German government) right down the middle. In the wider European context, it is perhaps fortunate for the EU that the Commission targeted Poland rather than Hungary. The Hungarian prime minister has made no secret of his admiration for the Russian president, and hinted that there is always the danger that if the EU is not nice to Fidesz then the more extreme right wing Jobbik lurks in the wings. Poland lacks the obvious (more) extreme-right challenge, and for historical reasons can hardly look to Vladimir Putin for help. The EU faces a unique challenge from the right-wing populist governments in Hungary and Poland, and their ‘illiberal democracy’ project. The Hungarian strategy can be described as one of disloyalty – an effort to creatively comply with the letter of the EU law (see here). This pattern of creative compliance has increasingly centralised political power to an extent that is ultimately incompatible with the EU’s legal and political system. The big dilemma for the EU is that inaction undermines the credibility of the Union (and timid action against Fidesz emboldened not only the Polish government, but also its Slovak and Romanian counterparts); whereas invoking Article 7 is unlikely to lead to sanctions and might well backfire. This dilemma is particularly serious because the Polish and Hungarian crisis involves not only regular right-wing populism, but also Euro-scepticism and illiberal ideology. This is not a classic anti-elite revolt by alternative groups that want access to the political power and exaggerate their rhetoric on the campaign trail; it is direct onslaught on the very rules of the liberal democratic game. It is far too easy to dismiss Fidesz and PiS as part of a broader new populist wave. Although Hungary and Poland are part of a broader anti-elite backslash against consensus politics, they are a far cry from the Nordic and Dutch Protest parties of the 1970s and 1990s and Silvio Berlusconi’s Forza Italia, or even the hard right of Le Pen and Wilders. Fidesz and PiS fit this broader pattern at first sight, but present a bigger problem for the EU. The Nordic, Dutch and French populists’ rejection of the Social Democrat-Christian Democrat consensus on the welfare state, the social market economy and immigration is a policy challenge. The Greek, Italian, British populist Eurosceptics added political challenges as well. But Fidesz and PiS represent a challenge to the very integrity of the EU system. To be sure, Fidesz and PiS draw on the three elements of populism found elsewhere in Europe: the Nordic, Dutch and Berlusconian populists’ claim to represent the ‘real’ people; the Euroscepticism of the Cinque Stelle and Greek populists on both flanks; and the nativism of Marine Le Pen, Geert Wilders and Matteo Salvini. But they base this on a (self-declared ‘Christian’) nationalist ideology – established in opposition not only to the centre-left but also presented as an effort to define the post-communist right against more pro-EU and market-liberal rivals – and they derive from it an open distrust of the institutions of liberal democracy. The most important dimension of the Polish and Hungarian populism is that it is a challenge to understandings about what constitutional democracy is about – and that this has brought the two parties to power. Fidesz and PiS go further than most West European populists in their open distrust of liberal democracy, most notably the idea that governments should be constrained by the rule of law. Like other populist parties they claim a unique insight into what the genuine ‘general will’ of the people is; but unlike their counterparts elsewhere in Europe they have both the will and the means to translate this into a power-centralising project designed to diminish the chances of them ever losing another election. Populist parties in Norway, Italy, Austria and Denmark moderated their rhetoric when they entered the corridors of power; Viktor Orbán and Jarosław Kaczyński amplified it – and matched it with action. It is this challenge to the rule of law and liberal democracy, not the ideological challenge or policies that jar with existing EU policies, that is the big problem for the EU. Protectionism and unorthodox economic policy might be a challenge, but the EU is robust enough to weather that. The problem is when it comes with centralization of political power in a way that undermines the basics principles the EU was established to defend – democracy, freedom and the rule of law. So where is the dilemma for the EU? The problem is that Poland has so far ignored the Commission’s measures under the EU’s Rule of Law Framework, secure in the knowledge that Hungary can veto any Article 7 sanctions. Inaction encourages further backsliding, but action might simply expose the limits of the EU’s capacity. This probably explains the Commission’s reluctance even to use its ordinary infringement powers against Hungary to their full extent, and its slow and wary road to confrontation with Poland. But the dilemma is even worse than that. Even a degree of success in the Commission’s confrontation with Poland – such as the German government taking the lead and mobilising a four-fifths majority censure vote in the Council – could end up exacerbating relations between most of the EU and its more populist governments. If this emboldens states such as Sweden in their quest to link EU funding to compliance with EU rules in the next Multiannual Financial Framework, it could tip the balance between the costs and benefits of EU membership for illiberal governments. When Norway confronted the Fidesz government over is abuse of power and suspended the European Economic Area funds, this had the desired effect of reversing Hungarian policy. But a wider confrontation over EU funds could also end up pushing Poland and Hungary out of the Union. In a real policy dilemma, the only way out is to choose one of the two possible courses of action. Inaction rarely solves the problem. The EU has already lost the opportunity to deal with backsliding when it was a minor challenge. It must now address it before it becomes a systemic crisis. Is it worth taking the risk that the EU loses two or more member states, or is it better to risk that the EU’s legal system is undermined? The Commission has now played the ball over to the member states. Let’s hope it is not too late! Back in the post-First World War era, the field of public administration was established to respond to the social upheaval of demilitarization, economic turmoil, expanding electorates, new political parties and labour movements. Similarly, the rise of ‘policy analysis’ was a response to the devastating experiences of the Second World War, and a belief in technocratic solutions and analytical skills provided by ‘wiz kids’. Concern with policy was also at the heart of the expansion of policy-related research and teaching in view of the expansion of the welfare state in the late 1960s and 1970s. A century since the end of the First World War, national and international politics and economics are again in turmoil. National politics are shaped by new cleavages surrounding identity and the rise of populist parties; European integration is being challenged by referenda (‘Brexit’) and nationalist governments adopting policies hostile to basic principles of the rule of law, in some cases going as far as sanctioning extreme-right movements and anti-semitism. Multilateral organisations are said to face existential threats. Traditional sources of policy expertise are criticised and dismissed; ‘fake news’ have become a defining characteristic of populist leaders with authoritarian ambitions. In short, what has been identified as an age of identity politics is perceived as a threat to many certainties of late 20th century politics. What role can contemporary public policy schools play in this changing and demanding context? Do they have anything to contribute? Or are they stuck in a world of elite hobnobbing across international conference venues, airport lounges and intercontinental conference calls? At first sight such questions may seem surprising. After all, hardly a month goes by during which one university or another does not announce a new public policy-related initiative. However, a closer look reveals more deep-seated problems. Public policy schools need to seriously reconsider their role in this ‘identity’ politics age of the 21st century. The rise of public policy schools was about bringing knowledge, expertise and analytical skills to executive government and the design of public service. They were supposed to ‘train’ and ‘network’ leaders and directly contribute to the better design and delivery of policy programmes to address major global, national and local policy problems. Success is measured in terms of contribution to solving specific policy problems, for example, climate change, derelict housing estates or energy self -sufficient bus shelters. Instead of ‘theory’, there is faith in ‘what works’ when designing individual policy interventions. The technocratic economic-managerial problem-solving bias of this undertaking is partly complemented by an emphasis on ‘governance’ that is supposed to signal the importance of hybrid forms of governing (across local, national and international levels) involving collaboration and negotiation among state and non-state actors. This broad orientation in public policy schools has traditionally been delivered in three different (sometimes overlapping) flavours. One is the particular economics-based flavour. Accordingly, ‘rigorous’ analysis using latest quantitative methodologies is the basis on which all decisions should be taken. A second flavour is more oriented towards the need to address ‘global’ policy problems; accordingly, the search here is for understanding and supporting international actor networks, organisations and transnational regulation. A third, more managerial flavour focuses on questions of measuring performance and supporting collaboration and leadership so as to identify public value. We observe three responses to the underlying societal, political and institutional dynamics that shape the contemporary context of identity politics. These can be characterised to be of the unreflective ‘must try harder’ kind. One response, building on the first (economics-based) flavour is to add to the methodological fire-power. Adding a few field and ‘laboratory’ experiments to the tool-set and giving a nod or two to ‘behavioural insights’ is supposed to address questions of great societal relevance (‘usable knowledge’). If evidence gets contested, we need to produce ‘harder’ evidence. Big data is said to come to the rescue. However, whether such a ‘factual knowledge’ approach, based on a continued commitment towards methodological individualism, is going to support organisational decision-making by executive governments in an age of ‘post-factual’ politics is questionable, especially when all ‘facts’ are part of the conflict between highly polarised societal cleavages. The second response is to increasingly ‘go global’. Transboundary policy challenges are proliferating, and therefore there has to be growing awareness about transboundary governance at the international level. The problem here, however, is that policies are ultimately also local: the ‘go global’ orientation is interested in overcoming horizontal boundaries between states and business and NGOs, but ignores the (vertical) organisational boundaries and administrative limitations that occur at the national and sub-national levels. The third ‘must try harder’ response is to rely on ‘better management’ to understand a world full of ‘(mega-) wicked issues’. Hybridity and mediation are said to be defining features of contemporary governance, and so is performance management. Post-financial crisis, a growing concern has also been paid to ‘ethics’. By offering the latest interpretation of how to achieve ‘public value’, social innovation or collaborative ‘leadership’, underpinned by some case study or another, international elites are prepared to respond to critical policy challenges. The problem here is unfortunately that these case-story materials are highly context-dependent. More fundamentally, there is an emphasis on charismatic leadership in which everyone is supposed to be a ‘leader’, setting up and leading their own unit, agency or NGO. Such an emphasis on change-makers reinforces contemporary managerial fashions that have missed the importance of the mid-level in any organisation. Is this really all that public policy schools can offer? If we take seriously the view that all expertise is part of societal conflict, that elites are part of a cleavage between ‘somewheres’ and ‘anywheres’, and that these somewheres and anywheres communicate in their own exclusive (social media) echo chambers, then can public policy schools move outside their own little echo chambers? Can public policy schools be more than just an amplifier of their own social movement? We are of course exaggerating the problem. There is plenty of activity among public policy schools to engage with this new age of identity politics, whether it is by hosting conferences, arranging public events or by embarking on new avenues, such as by focusing on digitalisation and democracy. Students need to be exposed to latest scholarship. However, if programmes and curricula are the central aspect of a public policy school’s mission, then some fundamental elements need to be addressed. This means that populism, polarisation and new cleavages have to be taken seriously so as to understand better the context of actual public policy making. This context does not occur in the confines of ‘laboratories’. Instead, what is required is a greater emphasis on the substantive understanding of policy. While we all know about the importance of ‘analytical’ and boundary-spanning competencies so as to allow for cross-sectoral application of policy-analysis skills, this cannot come at the expense of understanding how organisations in a political context actually ‘work’, how legal and constitutional boundaries need navigating and what the particular technical challenges in certain policy domains are. We also need a growing emphasis on fairness and acceptability of public policies in order to seriously engage with the (usually voiceless) vulnerable. What is also required is a more direct exposure to the real world at the coalface of public policy. This is the world of the social housing estate, the nursing home, the meat and drinking water inspector, the banking supervisor, prison warden, the data analyst and cyber-security official as well as the tax and welfare office; it is the world of dealing with socio-economic and ethnic difference. It is at this level where the world of great expectations meets complex reality. It is at this level where austerity becomes real, where abstract conflicts become real fights and the coping strategies of the street level bureaucrat become the actual policy that not only decides about the kind of services people need and receive – but also the way the state is experienced and perceived by those that are said to be estranged from politics and institutions. Such an ambition is far from new. UC Berkeley in the 1960s ran a multi-year Oakland project (under then dean Aaron Wildavsky). One of these research projects eventually fed into the seminal book on ‘Implementation’ (by Pressman and Wildavsky). Students, researchers and faculty were exposed to the coalface of policy making and public administration in a truly unruly context. Such a theory-informed programme is difficult to deliver – it requires trust between the different parties. It is also difficult to deliver in the context of ever-shorter and intensive executive programmes that involve time-poor students with highly demanding jobs. It is also difficult to deliver such courses which are potentially disruptive to a well-healed clientele used to getting their ways in terms of demanding ‘content’. However, if public policy schools want to be part of the solution rather than remain part of the problem of the contemporary age of identity politics, then they need to transpose an Oakland spirit into their contemporary offerings. This might, at first, prove demanding, given financial business models, donor and student expectations and academic career incentives. However, such considerations should ultimately not trump the ultimate purpose of public policy schools, namely to offer the springboard for an advanced ‘speaking truth to power’, even in an age in which power is dispersed and sources of truth are contested. The Catalan dispute: A new transboundary crisis in Europe? Over the past few weeks, the Catalan dispute with the Spanish government has attracted international attention. While the non-negotiated referendum on self-determination held in Catalonia on 1 October (1-O), which was forbidden, persecuted and partially blocked by the Spanish executive and judiciary, made the global headlines, this case has been incubating for at least the last five years as tension between these two levels of government in Spain has grown. This is a very complex territorial dispute that we do not aim to interpret or disentangle here. The dispute has increasingly hardened and we still do not know if it will escalate even further. The conflict has diversified into many battlefields; it involves the legal and constitutional dispute, the political legitimation argument, economic struggles to influence firms to move their location, frenetic foreign policy pressure, and competing journalistic narratives on the logic and justification of the dispute. This is an extraordinary territorial dispute, an (almost) non-violent war in Europe, that also involves two global cities (Barcelona and Madrid) sharing the same state, where the former perceives there to be a lack of state support to compete globally. The dispute has not ended and currently we are witnessing a peak in political tension between these territories. It is therefore very difficult to predict what will happen after the crisis. Our purpose here is to discuss whether this conflict can be considered a European transboundary crisis. In addition, we consider the potential implications, in the short and long term, of these developments from a European-wide perspective. First, we should establish the preferences of the Spanish and Catalan actors as to the role of European institutions. On the one side, the Spanish government frames the dispute as an internal territorial issue, one of misbehaviour by a subnational government that has to be addressed according to existing constitutional tools. On the other side, the Catalan government aims to Europeanise the conflict, expecting EU institutions to act as mediators in the dispute between the two levels of government. We can identify some clear evidence of the involvement of EU institutions during the weeks after the referendum. For example, the European Parliament had a debate on the Catalan referendum a few days after the referendum, on 4 October. Also, some EU Commission officials made declarations about the importance of respecting the constitution, but also asked for dialogue and negotiation between the two sides. Possibly more significant was the direct intervention of the President of the European Council, Donald Tusk. On the same day (10 October) the Catalan President was expected to declare Catalonia’s independence, Tusk declared on Twitter: ‘I appeal to @KRLS not to announce a decision that would make dialogue impossible.’ This apparently deterred the declaration of independence that day. Thus, it is clear that different EU institutions were directly involved during the two weeks after the Catalan referendum, not taking sides, but advising on two main issues: respecting the Spanish constitutional rules, but also starting a dialogue between the two parties. Many reasons exist for EU institutions to be involved in this politico-territorial crisis, but two are most evident. First, there are the European-wide financial risks this crisis could trigger, considering the heavily indebted Spanish state and the weakness of the Spanish economy. A sudden paralysis in Catalonia could have direct effects in many European economies. Existing connections and interdependencies could attract risk-takers from the entire world to bid against the Spanish treasury. Second, a massive violation of citizen rights in Europe, if it happened, could seriously undermine European soft-power worldwide. This is not a minor issue as European soft-power is the most powerful weapon European countries have. Police attacks on voters, even for a non-legal referendum, are not easy to digest and raises concerns about the ability of European countries to manage their territorial conflicts. Apparently, the EU’s involvement in dealing with this crisis was quite effective as political tensions de-escalated and independence was not declared. However, since then, the expected dialogue has not materialised. The Catalan and Spanish governments did not establish any form of conversation. There was only a letter from the Spanish government to request the Catalan government’s obedience to Spanish law. This letter prompted a critical reply by the Catalan government, which conceded, however, that independence had not been declared. In any case, it appears that this exchange took more account of the respective electoral constituencies than anything else. At the same time, a request made by the Catalan government to look for a conflict mediator, either appointed by EU institutions or jointly nominated, was rejected out of hand by the Spanish government. This episode illustrates a more profound disagreement: the Spanish government considers a hierarchical logic in its relationship with Catalonia, derived from the unitary nature of the Spanish state and its administrative culture. In contrast, the Catalan government intends to establish a horizontal relationship with the Spanish government, arguing that sovereignty also emerges from the Catalan parliament and the Catalan citizens, as expressed in the 1–O referendum and previous regional elections. Arguing this, the Catalan government would easily concede that, due to the plebiscite’s unclear procedures, there is always the possibility to convene a new, mutually accepted self-determination referendum. However, the Spanish government is not open to this option, insisting on the subordinate character of Catalan institutions to the Spanish-wide ones. However, the positions of member states were far from homogeneous. While large and centralist countries like France were the most supportive of Rajoy, some small countries with a history of self-determination struggles, or with highly decentralised structures, sympathised with the Catalan position. In the end, a sort of political realism prevailed and an informal consensus emerged in the sense that any reaction against the Madrid government might create problems for future EU decision-making processes. Backed by the non-discussion of the Catalan case at the European Council, the Spanish government reacted quickly to prepare its intervention on the Catalan semi-autonomous government, taking over the Catalan key institutions and firing top Catalan government officials, including its president. This was consistent with the hierarchical power logic declared by the Spanish government. It discarded any type of external mediation between the two governments that might have opened up a political dialogue as to the restructuring of territorial politics in Spain or any other possible outcome. To this end, Rajoy accepted a vague promise to reform the Spanish constitution soon, aiming to maximise support among Madrid’s political and economic elites, while ignoring or dividing Catalan ones. The Catalan crisis is still far from being resolved, or even stabilised. The millions of Catalan citizens that did participate in the referendum cannot be disregarded completely. In other words, the elephant is still in the room. EU institutions have stepped back and have not encouraged any dialogue or mediation, despite their claims immediately after the referendum. Thus, is the Catalan case actually a transboundary European crisis? Despite there being no formal involvement of EU institutions, it is evident that it is a crisis that is debated intensively by the European media, closely scrutinised by European institutions, and that might be having potential economic and social consequences for all European countries. In fact, it is a crisis Europe cannot evade. Salient transboundary crises emerge in Europe quite often. Those kind of crises relate to the environment, public health, financial markets or other issues that arise from the interdependencies of integrated and integrating markets, entrenched multi-level public policy and the emerging European citizenship. Whatever is creating a big shock in one corner of the EU might have consequences for the entire Union, either in terms of reputation, public health or material welfare. Multiple mechanisms and institutions have been created at the EU level to cope with transboundary crises of this type and, most importantly, to prevent them in the future. The newly created banking crisis schemes are a case in point. However, Europe lacks effective mechanisms to cope with political crises, despite the complexities of the emerging European polity. Whether it is a threat to the constitutional division of powers, the presence of a salient territorial dispute, or the restriction on constitutional rights, such dynamics at the member state level are currently dealt with through inter-governmental procedures, basically at the European Council. Member state governments are naturally very reluctant to have other member states meddle in their domestic affairs. The existing procedures, as already illustrated in the case of Poland and Hungary, are very slow, they are very modest in their impact, and, what is much worse, they do not provide credibility-enhancing mechanisms to ensure that democratic institutions work, or that political compromises are respected. The author of this blog writes in a personal capacity and does not represent the TransCrisis project team as a whole.